Whoa, Francis Crick's DNA letter has sold for $5.3 million! 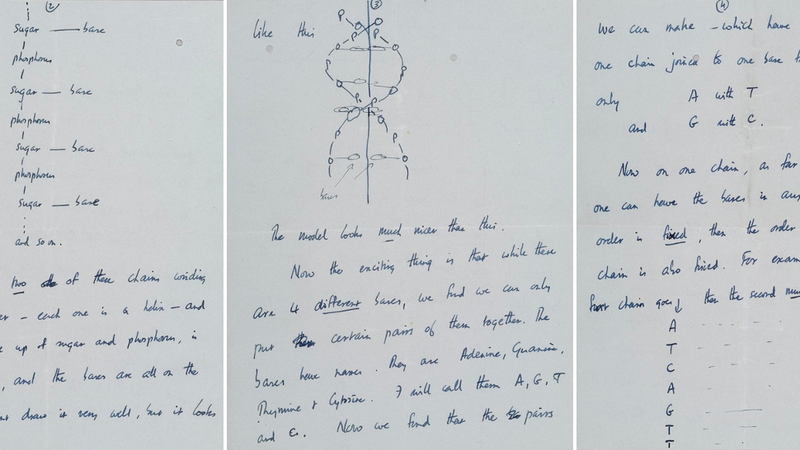 Looks like someone wanted this pretty badly: The letter that Francis Crick wrote to his son describing the structural detail of DNA has sold for a record breaking $5.3m at a New York City auction. That's more than $4m over the initial asking price. It's really not that difficult to understand why someone would pay so much; the handwritten letter is truly a special item. It's even been compared to the heads up letter that Albert Einstein wrote to Franklin D. Roosevelt warning about the potential for atomic weapons (which sold for just over $2m back in 2002). The Crick letter is now the highest ever sold at an action, eclipsing an 1864 Abraham Lincoln letter that sold in April 2008 for $3.4m. Crick wrote the letter on March 19th, 1953, to his 12-year-old son while he was still in boarding school. The letter opens: "Dear Michael, Jim Watson and I have probably made a most important discovery." He described the structure of DNA as something "beautiful," and that it was the copying mechanism "by which life comes from life." The letter even included a crude sketch of DNA's double helix structure. "Read this carefully so that you will understand it," he concludes. "When you come home we will show you the model. Lots of love, Daddy." The entire transcript can be read here. The letter is among a dozen other items Crick's heirs are selling to benefit scientific research. Proceeds will be sent to the Salk Institute for Biological Studies in La Jolla and the new Francis Crick Institute in London, a medical research institute due to open in 2015. How much would you pay for a Nobel Prize medal? Sources: Guardian, LiveScience, New York Times.